Ivoryand Oak, under jockey Jose Vega, winning the 17,500 Cherokee Nation Stakes Saturday night at Fair Meadows. 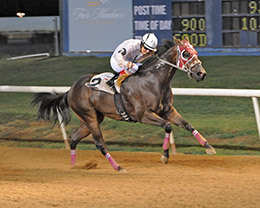 TULSA, OK�JULY 30, 2016�Ivoryand Oak defeated Country Admiral by a head in the $17,500 Cherokee Nation Stakes Saturday night at Fair Meadows to get his first career stakes win. Country Admiral was disqualified for interference by the track stewards and placed last, moving Captain Toodles into second and Cartel Envy to third. Ridden by jockey Jose Vega, Ivoryand Oak completed the 350-yard course in :18.028 seconds to pickup the winner's purse of $8,730. Michele Hurdle conditions the IVORY JAMES homebred for owner/breeder Charles Vanderford. Ivoryand Oak was bred in Georgia from the Oak Tree Special mare Show Me The Oak. Third in the Oklahoma Juvenile in March, he has compiled a (6) 2-1-2 record and earned $21,838 this season. R.L. Rick Robinson saddled second place finisher Captain Toodles for the Estate of Fred Yamaguchi. Agustin Silva rode the Texas homebred. He earned $2,910. Cartel Envy earned $1,876 for third. Guillermo Valdivia trains the brown filly for owner Charles Cox. Jeff Jones and Steve Hold is the breeder. Completing the official order of finish were Jc Lovin You, Can Only Imagine, One Corona Episode Okies Cc, Tac My Prize, Catmandu and Country Admiral.